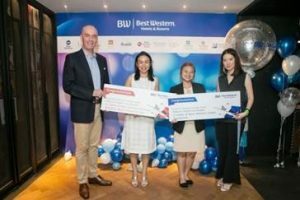 Bangkok (Thailand) – March 9, 2018 (travelindex) – Best Western Hotels & Resorts has said a big “thank you” to its partners and associates in Thailand with a glittering party in Bangkok. The Best Western Appreciation Night 2018 was hosted at Beer Republic, the popular venue in the heart of the Thai capital. It gathered approximately 70 of the company’s closest partners, including marketing companies, travel agents, journalists and influential bloggers. The event provided an exclusive opportunity for guests to catch up with the Best Western Asia executive team, enjoy delicious drinks and snacks, and network with like-minded friends and colleagues in a casual atmosphere. And of course, it allowed Best Western to express its deep appreciation to all its awesome associates! A prize draw was also held during the night, with fantastic prizes including Best Western-branded luggage and amazing holidays in Phuket and Japan! Ms. Sareewan Sudsanit of Krungsriayudhya Card won a two-night stay at Best Western Premier Bangtao Beach Resort & Spa, including return flights for two people to Phuket, and the first prize went to Ms. Jiraphon Bupsiri of N.S. Travel & Tours, who won return flights for two between Bangkok and Osaka and a two nights’ accommodation at Best Western Osaka Tsukamoto, including breakfast. “At Best Western Hotels & Resorts, we truly value the contributions of all of our partners. We would not succeed without the efforts of all our associates, from the travel agents who sell our hotels to their clients to our media and marketing partners who ensure that we stay in the limelight,” said Olivier Berrivin, Best Western’s Managing Director of International Operations – Asia. “We are delighted to welcome so many of our esteemed partners to the Best Western Appreciation Night 2018. This is our way of saying ‘thank you’ for their efforts, and we look forward to establishing even stronger relationships with our partners in future,” Olivier added.